Spools for teh shipment of steel cord, hose wire, wire saw and special wire. Different versions are available with different charge capacity depending on the specific application and with different solutions for the surface treatment. 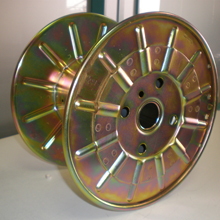 The driving plate is available with increased diameter and, for special applications, it can be welded with double electro-welding for each sector of the flange (S serie).